Dr. Anita Lal is a Professor at FORE. Her expertise lies in the areas of Business Communication, Leadership & Entrepreneurship. She has over 21 years of work experience in the areas of teaching, training and research. Her experience of teaching also includes three years as a visiting faculty at IIT Delhi and IIT Kanpur. 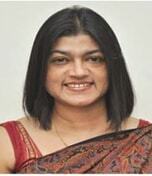 She has keen interest in personality development and research related activities. She has national and international research papers to her credit in the areas of Business Communication and Entrepreneurship. She has been a part-time consultant for three years to NTPC’s World Bank funded projects on Environmental Impact Assessment. Connecting with Industry and conducting MDPs is her forte. Has conducted number of open & customized MDP’s and workshops in the areas of ‘interpersonal relationship, communication & presentation skills, assertiveness, positive attitude, 5th dimension of leadership, entrepreneurial competencies, opportunity evaluation and business model & plan’ for corporate in various MNCs and public & private sectors. She is able to create an ideal blend of Leadership, Entrepreneurship and Communication in her training programs, few of the most potential skills critical to creating success stories for Organizations in today’s uncertain times. A Ph.D. from IIT Kanpur and also the recipient of the prestigious Certification with Honours on ‘Mentor Development Program for Entrepreneurs’ jointly conducted by London Business School and National Entrepreneurship Network. Being a certified mentor she has been successfully mentoring entrepreneurs. Her passion though, remains ‘Student Start-ups’. She has been felicitated by TiE New Delhi for her contribution as a Mentor to the TiE Young Entrepreneurs (TYE: 2014-15). She is also on the ‘Mentoring Board’ of IIT Kanpur Entrepreneurship Cell and Amity University. At FORE, she is also Heads the Centre for Entrepreneurship Development. Business Communication; Entrepreneurship; Leadership & Participatory Rural Appraisal.